Australia's parliament has passed legislation that means all tobacco will need to be sold in plain olive-brown packets with graphic health warnings. Canberra said the law was "one of the most momentous public health measures in Australia's history". It said it had served a notice of arbitration under Australia's Bilateral Investment Treaty with Hong Kong. PMA's Australian affiliate Philip Morris Ltd (PML) will also pursue claims under Australian domestic law. PMA is arguing that removing its trademarks from tobacco packaging will cut its profits and see fake brands flood the market. Spokesperson Anne Edwards said: "The government has passed this legislation despite being unable to demonstrate that it will be effective at reducing smoking and has ignored the widespread concerns raised in Australia and internationally regarding the serious legal issues associated with plain packaging." PMA said it wanted the legislation to be suspended. It said it would ask for compensation for the billions of dollars it said the new law would cost it. British American Tobacco, another big cigarette company, has previously said that the legislation infringes international trademark and intellectual property laws. Under the new law, the only thing distinguishing tobacco brands on packets will be the brand and product name in a standard colour, position, font size and style. 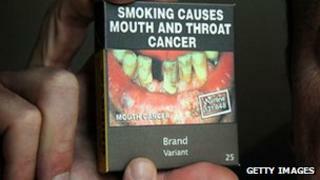 Australia's Minister for Health and Ageing Nicola Roxon said while the tobacco industry was "fighting to protect its profits, we are fighting to protect lives". "We know that packaging remains one of the last powerful marketing tools for tobacco companies to recruit new smokers to their deadly products. In the future, cigarette packets will serve only as a stark reminder of the devastating health effects of smoking," she said.